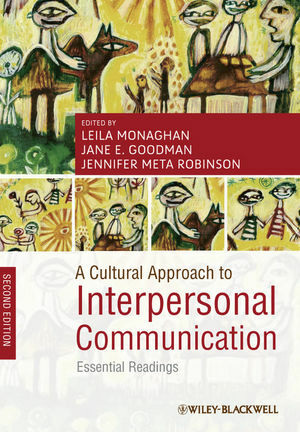 Featuring several all-new chapters, revisions, and updates, the Second Edition of A Cultural Approach to Interpersonal Communication presents an interdisciplinary collection of key readings that explore how interpersonal communication is socially and culturally mediated. Leila Monaghan currently teaches anthropology and disability studies at the University of Wyoming and the University of Maryland University College. She served as course director of Interpersonal Communication in the Department of Communication and Culture at Indiana University for four years. Her publications include the co-edited volumes Many Ways to be Deaf and HIV/AIDS and Deaf Communities. Jane E. Goodman is an associate professor in the Department of Communication and Culture at Indiana University. She is the author of Berber Culture on the World Stage: From Village to Video, and editor of Bourdieu in Algeria: Colonial Politics, Ethnographic Practices, Theoretical Developments. She served as course director of Interpersonal Communication in the Department of Communication and Culture at Indiana University for three years. Jennifer Meta Robinson is a senior lecturer in the Department of Communication and Culture at Indiana University. She is author of The Farmers' Market Book: Growing Food, Cultivating Community, editor of Teaching Environmental Literacy: Across Campus and Across the Curriculum, and editor of the Indiana University Press book series Scholarship of Teaching and Learning. She has served as course director of Interpersonal Communication in the Department of Communication and Culture at Indiana University since 2006.